Folksongs and Instrumentals with Guitar LP cover artwork. 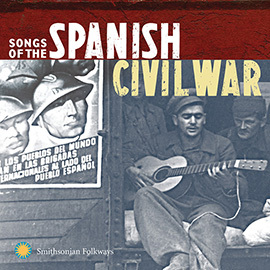 Freight Train and Other North Carolina Folk Songs and Tunes CD cover artwork. 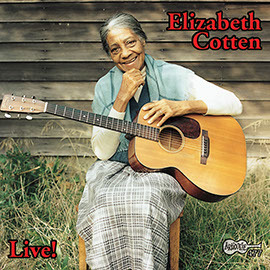 Elizabeth Cotten's 1958 debut album Folksongs and Instrumentals with Guitar, (aka Freight Train and Other North Carolina Folk Songs and Tunes) is best known for containing the earliest recording of her classic "Freight Train." The breadth of her repertoire and her endearing style have captivated generations of guitarists and fans of traditional American music. 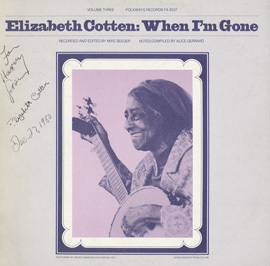 Cotten's self-taught, upside-down, left-handed playing style on the guitar and banjo made her a true original. Many of her deeply personal compositions, such as the immortal "Oh Babe It Ain't No Lie," are included. “[A] classic and belongs in every collection..." — Blues Review Quarterly. 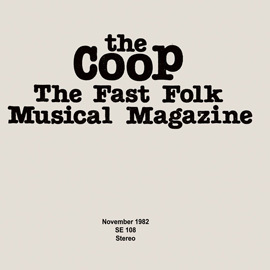 This reissue is part of the Smithsonian Folkways Vinyl Reissue Series and features Mike Seeger's updated notes with comments on Cotten's life, musical style, and song lyrics. 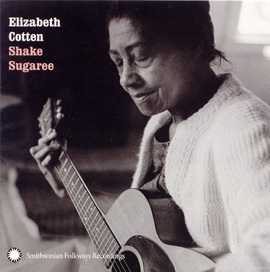 For a limited time, we are offering Elizabeth Cotten's Folksongs and Instrumentals with Guitar, Lucinda Williams's Happy Woman Blues, and Mary Lou Williams as a Vinyl Bundle with Bonus Folkways Slipmat.